In 1968, "K" Line completed construction of the Toyota Maru No. 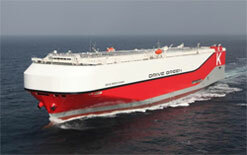 1, a multi-level car carrier with a capacity of 1,250 vehicles. Since then, "K" Line has continued to focus its energy and passion as a pioneer in the transport of completely built-up cars. We introduced the Toyota Maru No. 10, Japan's first pure car carrier (PCC), in 1970, and the European Highway, the world's largest PCC at the time (with 4,200-vehicle capacity), which also boasted the highest navigation speeds, in 1973, consolidating our position as a world leader. 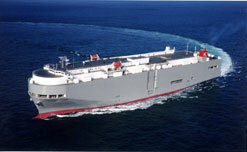 "K" Line has been endeavoring to innovatively reinforce its car carrier fleet with in-depth consideration to environmental preservation in particular, as well as to perform service in the handling of complete cars that is entirely damage-free at all times during loading and discharging operations as well as during ocean navigation. From viewpoint of oil pollution prevention and environmental preservation, "K" Line adopted a new method in which fuel and bunker oil tanks are designed to be placed within a triple-bottom structure. This new method increases the protective capabilities of the tanks when a ship's hull is damaged. In Feburary 2016, the first of 8 identical vessels within a shipbuilding contract was launched. In what is described as one of the largest solar energy systems on any ship in the world, the car-carrier features more than 900 of Solar Frontier's copper, indium, selenium (CIS) solar panels. With a combined capacity of 150 kWp, the panels will power all LED lighting on the vehicle decks. In addition "K" Line ordered two (2) additional new next generation 7,500 RT car carrier vessels with delivery in 2017 from Shin Kurushima Dockyard Co. Ltd. By adding these two new additional ships, line-up of our new next generation car carrier vessels with better stability and increased fuel efficiency will expand to a total of ten. For more information on the vessels' environmental protection and energy savings capabilities and the 'DRIVE GREEN PROJECT' select here: /Environment/Green-News-Releases/140212-K-Line-Invest-Flag-Ship-Drive-Green-Project.html. We are committed to continue to deliver value added efficiency as well as the capability of handling an even wider variety of cargo mix to assure our services successfully meet the needs of our valued customers in order to be best suited for not only passenger cars but also other RORO cargoes.